Ash Barton - An ancient manor house overlooking the Devon coast line - perfectly placed to enjoy Devon! Sleeps up to 35 in 13 bedrooms with 9 bathrooms. Weekends from £3,995 to £9,995, full weeks from £6,995 to £13,995. For shorter stays please enquire. If fully occupied, price per person per night is usually between £29 and £95. Ash Barton offers freedom and beauty. You are free to do your wedding, your way. No rules. Over a mile from our nearest neighbour with no curfews or noise restrictions. Stunning setting with an optional outdoor wedding license. Separate marquee possible but not necessary. Plus a ruined chapel! Seats up to 200 indoors and the total venue capacity is 200. Michael Jackson's family were looking for a property in North Devon in the late ’90s and looked at Ash Barton just before the current owners bought it! Dating back to 973 AD, Ash Barton is as old as it is beautiful. The manor house sits high above the North Devon countryside, with spectacular views over the moors to the sea in the distance. The house is divinely suited for a Bohemian country wedding, or a weekend break with family or a group of friends. Ash Barton has 13 bedrooms and can sleep up to 35, with the use of bunks and fold-up beds. There are 9 bathrooms. Downstairs, there is a large kitchen and sitting room (with a piano), and a dining room. There is also a fabulous indoor swimming pool. The Games Barn is an ideal space for large parties and functions, and contains lots of diversions, such as pool tables, a trampoline and fully-functioning disco space! Ash Barton has 25 acres of woodland and meadows, and within the grounds is the old chapel, which makes a very romantic setting for a wedding, or more intimate party. It can seat up to 50 to dine, 100 to sit as an audience. Ash Barton is only 3 miles from Saunton Sands with its famous dunes. The house is an excellent base for a Devon holiday, as it allows easy access to the north coast, including Ilfracombe, Lynton and Lynmouth, yet is still within reach of resorts and attractions to the west of Barnstaple such as Bideford, Appledore and Clovelly. It is a 20-minute drive from Exmoor and 30 minutes from Dartmoor. There is a huge amount to do in the area; walking in the nature reserve at Braunton Burroughs (great for bird watching) and surfing and kite-surfing at Croyde. Putsborough, to the west side of Woolacombe Bay, is perfect for coast walking, and the Tarka Trail (for cycling) passes very close to Braunton, Ash Barton’s village. For those ‘staying in’ there is a full range of garden furniture, outdoor barbecue and even a fire pit. Inside the house has log burning stoves for wintery evenings. You can be married out on the lawn, or inside: the choice is yours. The chapel can hold 100 as a congregation, and the Game Barn has a capacity of 200. Best of all…no curfew! For details of Special Offers, or Last Minute availability, please call Ash Barton. Had a fantastic wedding. Stunning surroundings. Felt like home for a few days. Couldn't have imagined anything better. All our guests had nice things to say about the whole venue. Would highly recommend this place to anyone that wants to make their day extra special. — with Danielle Knight and 7 others. We attended a wedding there this weekend (Steve & Naomi) 16/02/19 What a BEAUTIFUL place, in a gorgeous setting. I’d highly recommend the Ash Barton Estate for anyone looking for a wedding venue. The facilities are amazing, the views and scenery are spectacular. I just spent my 30th birthday at the Ash Barton Estate and had the most amazing weekend!! Simon, Pete and Tom were so incredibly helpful and friendly and dealt with all my questions very quickly! The house is absolutely stunning and so clean. I especially loved the huge kitchen! The chapel is also beautiful and was a great place for me and my guests to get together for a dinner party! However the highlight of the estate for me has to be the barn!! It has everything you could possibly need! A great sound system, plenty of games, a dancefloor, sofas and even an indoor pool! The fairy lights everywhere just added a touch of magic to the whole place! Overall I would highly recommend the Ash Barton estate and I will definitely be going back again soon! We had the most perfect wedding day at AB... Everyone is so helpful and the place is beautiful. Wonderful magical enchanting place for a wedding. My stepdaughter’s wedding was 1st December and it was amazing. Fantastic place - lots of the guests stayed in the house so it was a great opportunity to get to know people before the big day. Thank you Ash Barton for making her day. We will be looking at booking up for a family holiday - although not next year as you are fully booked. We had the most wonderful weekend at Ash Barton for our wedding in August. The venue was the perfect mix of an incredibly beautiful setting but with a laid back feel and Simon, Pete and the rest of the team were unbelievably helpful, relaxed and flexible. Every wedding venue needs a Pete - his help was invaluable to us over the weekend and he made our ambitious decorating and set-up plans not just possible, but easy. Not to mention him doing the most amazing surprise clean up job overnight so we were free to nurse our hangovers and BBQ on the Sunday. We had immediate family and wedding party staying in the house, plus more camping on site and plenty of guests in local accommodation, and we enjoyed making use of all the different beautiful spaces around the property for friday night dinner, drinks, games, BBQ etc. An amazing venue, which is really one of a kind and allows you to make the day completely your own. I'd like to do it all again. We have had the most wonderful time at the Ash Barton estate for our wedding - there is definitely something very magical about the place. We had 30 people staying in the house and we had 170 people for the wedding day and everything went smoothly. Simon and Pete were fantastic and helped us throughout all the planning, we have had so many of our guests talk about how great the house is. We would definitely, 100 % recommend the venue!! Thank you! We could not have asked for a more perfect venue for our wedding! We wanted somewhere beautiful with lots of charm and character but also somewhere laid back that would suit a more festival style weekend of celebrations - Ash Barton was all of those things. We had 25 bell tents set up in the field behind the barn and between those and the house we had almost 90 people staying on site for a couple nights! We had a huge number of friends and family traveling in from out of the country and it was wonderful for so many of them to be able to be at the estate with us. We had a BBQ and drinks on Friday night on the patio with a bonfire when the sun went down. Saturday we got married in the lovely wildflower meadow, had cocktails, canapes and speeches in the walled garden and had food trucks come in for the evening (which was absolutely fantastic - I highly recommend it!). The evening party was spread between the courtyard, chapel and barn with a different vibe in each area. All of our guests had a fabulous time and couldn't stop remarking on how magical Ash Barton is! Simon was wonderful in the lead up to the wedding and happily (and quickly!) answered any questions we had. We loved the fact that he truly wants you to feel at home at Ash Barton and to make the weekend/day totally your own. Pete was absolutely brilliant while we were there, helping in any way he could, always with a smile. Nothing we asked was too big or small. He’s an absolute gem! We truly had the most amazing weekend and it’s one that we – and our guests – will never forget! We got married at Ash Barton on 1st May and it was all we could ever hope and dream for, everything went exactly to plan. Everyone commented on how beautiful the venue was, and how peaceful it was. The weather was typically British, We got married in the chapel, and had reception in the barn, both of which were warm enough even with the weather. The house was was super toasty. We loved the fact how chilled it was here, we had quite a few children coming to stay, who absolutely loved the games in the barn, but we were never made to feel on edge about the children running around. Pete was great, so helpful and never far if you needed a hand with anything. Nothing was too much trouble for him. All in all we had the most perfect day, and would highly recommend! We had our wedding at Ash Barton on Saturday and it honestly couldn’t have gone any better. Both Simon and Pete were always available to answer any questions we had beforehand whilst planning and did everything they could to help. We had so many compliments on the venue itself, too. We held our ceremony in the chapel and it looked stunning without having to add too much decor. The house was warm and comfortable and loved finding my way around. Eventually knew my way around by the time it was time to leave!! We were a bit short of hot water on the Saturday morning, but everyone was probably showering all at the same time. A special thanks to Pete who worked so hard for us and helped the day run as smoothly as it did. Very friendly and helpful and freed up a lot of time for us to spend with visiting family members. Lovely wedding reception! Fun with family, but very cold! Should have danced more I suppose! Must be a lovely venue in the summertime but we didn’t see much of it in the dark. Well what can we say? This magical venue has left an imprint on our hearts that will last a lifetime. While searching Google for ‘big barn wedding venue Devon’ I didn’t ever expect to find exactly what I was looking for all in one place. We booked without visiting, bowled over by the interactive web-tour and Simon’s enthusiastic sales pitch. We weren’t disappointed. Ash Barton exceeded all of our expectations. We charged family and friends a minimal amount to stay in a room at the house which helped to pay for other essentials and they were blown away. From the moment they set foot out of their cars to take in the surroundings, everyone relaxed. They adopted the house as their holiday home and the atmosphere buzzed with excitement as people were reunited and others made new friends. Being on site meant that we had control of every aspect, with a little help from Pete (couldn’t recommend him enough) we decorated the barn, chapel and dining room. Moved games to the walled garden and cooked up a storm to thank our guests for mucking in. The wedding was just perfect, we couldn’t have dreamt it would go so well. We invited over 20 children who were entertained for hours by the games barn - even I couldn’t resist a bounce on the trampoline in my wedding dress. I could go on about the relaxed uniqueness, humble beauty and how nature married with the stone walls - seeped in history, but you’ll have to see it to believe it. We can’t thank Simon enough, so many precious memories were made by everyone who attended. All said how unusually magical our wedding was and it was all thanks to this perfect venue. Just spent a fabulous fun weekend at the estate celebrating a double 40th. The property is in beautiful surroundings, well maintained and was perfect for our gathering. We had an amazing time. Roaring fires, gorgeous scenery, a pool and party area Just perfect. We were married at the venue first weekend in December. Words truly cannot express how amazing the venue is, it is just magical. Incredible to spend time with friends and family in between getting married. Pete is an absolute superstar worth more than his weight in gold! We all cannot wait to go back here to celebrate again. BEST House and owners you could hope.....a stretch for our budget...but worth every single last penny!!! Thank you Simon, your family and Pete! Thank you for allowing us to have such a wonderful time at the house. All the guests raved about the venue and there is already talk of going back some day for a more relaxed weekend to enjoy the house. The way you allowed us the freedom to use the spaces as a blank canvas and create our perfect wedding was just great - we truly could not have hoped for a better venue! Pete was wonderful and although he had his finger on the pulse, he made us feel like we really were in our own house and free to do as we wished. The first question I asked, he said ' it's up to you it's your house until Monday'. 'Our House' - ha - we wish!!! But how kind to give us that freedom. We also loved that Pete was suited and booted on the wedding day, it is those little touches that really make a difference. The ease at which we could book, the tour of the house and then being looked after when in the house - have all been perfect. I am sure you hear this a lot - We have been fortunate enough to travel to many amazing countries and seen many amazing things, but Ash Barton will be forever in our hearts as one of the most special places we have experienced. We simply loved being there! We celebrated our wedding on the 29th August 2017 and what a day!!! All ages and wide range of people came together to celebrate our special day and all enjoyed thoroughly, with the range of facilities and spectacular views. It rained on the wedding morning for the Indian ceremony but this did not spoil it as the barn could accommodate the ceremony due to size, it was just perfect. The happiest and most memorable extended family holidays in this home from home, amongst stunning scenery and within easy reach of the best beach in the world. We held our wedding at Ash Barton at the beginning of July and it was simply the best weekend of our lives. Having Ash Barton for 4 days allowed us to have several mini events over the weekend as well as our wedding so that we might spend as much time as possible with our friends and family. Simon and Pete were so helpful and relaxed which meant we really felt like we do whatever we wanted for the weekend and make it all super personal. The weather held out for us which meant we could get married under the oak tree- my dream location, have friends camping and family staying in the house, have fire pit drinks the night before the wedding and a pool party/ bbq the day after (complete with slip and slide). Simply perfect- Thank you! P.S Pete is the best investment you could make for the wedding, he goes beyond helping and we couldn't have done the weekend without him! What a place. We had a team of helpers to make such a beautiful venue even more magical. Everything that could have gone right did. It is a definite thumbs up from my wife and I as well as all our guests. We got 200 guests in and it still felt roomy. If anyone is in doubt about this place dont be, when you get there ur dreams come true. The games area was key for all our smaller guests as well as our bigger guests. The house was amazing as so was Pete. Thanks again Ashbarton.... till next time. The grounds and what we saw of the house are everything you expected , perfect ! What I didn't exspect was to drive 4 hours there are being told they are a dog friendly venue . Only to get there and be told the dogs can't come in the house . That we was going to be staying in for 3 days . Simon assured are that he was registered dog friendly if he let them in the grounds . To which I told him may be true . But anyone asking if you are pet freiendly and searching pet friendly venues for there wedding arnt exspecting in this case to leave their dogs out side for 3 days . So not a negative thing to say about the place itself just a heads up that it won't be for you if your dogs are living in your house and you wanted them there for your big day . It is hard to put into words everything that we would like to say about Ash Barton. Like others, there was NO doubt that this was THE venue for our wedding in April. We didn't feel like "punters", but more like old/new friends - spending time in a most magical and beautiful hangout with our favourite people. We � LOVE � Ash Barton. It is BEAUTIFUL and the perfect place for all manner of occasions. Our wedding became a three day party and it was more than we could have ever dreamed of. As promised by Pete and Simon (although it can't ALWAYS be guaranteed), the weather on the 4th was phenomenal... dark, moody skies broke to reveal bright and glorious sunshine - a couple of guests even got sunburnt. The house is gorgeous... relaxed enough to be - relaxed! But grand enough to give a sense of decadence and occasion. The grounds are stunning... something to suit everyone - even our beekeeper father!! � The ushers and bridesmaids loved the pool and the kitchen became a buzzing hive of activity (pardon the delayed and tenuous pun). If you are thinking about it, think no longer... DEFINITELY book. Fabulous place, could not have been a better setting for our daughter's wedding. The whole place is incredible, peaceful setting, beautiful house and grounds - amazing kitchen! The care taker is also a top bloke. Wonderful. Where do we start!!!! I knew the moment I drove up to the house that it was the place I would get married! It really is the most beautiful setting and if you have the weather on your side it completes a perfect weekend! Simon was so supportive during the wedding planning process, on our first meeting he took our two children to feed the chickens! He was very welcoming and made us feel at home. And Pete if you are thinking of booking Pete then it is a must he was incredible..... without his help it wouldn't have turned out the way that it did! Our family and friends were in complete awe of the whole place and loved the weekend, as did we...... we have already been talking about celebrating my 30 th birthday at the house ( that's how much we all miss it already)! Thank you again for a weekend we will never forget! An absolutely stunning place with great facilities. Awesome games barn with heated pool. Comfy rooms, wonderful views. Couldn't have asked for a better weekend away. Can't recommend this enough. Oh! I wish we lived at Ash Barton! We had such an amazing wedding there and are very grateful to Simon and Liam for making our weekend amazing. Everyone loved how beautiful yet relaxed the venue is, and we loved having all our friends and family around us for the whole weekend. The location is stunning. The house is incredible. The chapel is gorgeous. The game room is a very practical space. Wish we could do it all over again! We're still riding on such a high from what was the most spectacular few days of our lives. We got married on 2nd July 2016 and I can't rate the Ash Barton Estate enough as a venue for the most important day of your lives. There's a calm peace that washes over as soon as you meander your way down the long drive. The natural beauty needs no touching but allows for those personal touches to come alive with true ease. Taking a stroll past the lake and beyond offers breathtaking views and you turn back to see the wonder that is your home for a few days. Pete was also the most charming and helpful individual you could ever hope for. He cares so much about making your day perfect and looks ever so dashing in his suit too! Please, please, please lean on Pete for his knowledge - it will be soooo worth it. We got married in the chapel and had a marquee on the lawn in front of the lake. We kept the giant games room for our guests and spent Sunday in the pool. The house feels like home as soon as everyone is gathered around the wonderful kitchen. You can't ask for a better place to put up your nearest and dearest. Please, reach out to myself or my wife Aoife should you want to ask any questions about what we did, which suppliers we used etc as we'd love to help. Finally, thank you to Simon for being ever so helpful, witty and a pleasure to work with. Mr & Mrs Dannatt can't wait to return and I know all our guests feel the same way. We celebrated a 30th birthday at Ash Barton and enjoyed every minute. We made good use of the BBQ and loved spending time around the fire pit. The chapel was used to hold a party, and we spent one evening having a pool party. The games room was fun and it was lovely to have so much land surrounding the house. There is plenty of room in the kitchen and lots of space to park cars. A short journey to the beach, whilst being far away from other houses makes it the perfect location. We would definitely return! Thank you. Great estate. Superb venue for events - private like weddings, birthdays etc. Fantastic grounds ,gardens so much to discover. 2e loved the chickens and the eggs..... highly recommend. Choosing Ash Barton as our wedding venue was certainly the best possible decision that we made. It was love at first sight as Simon showed us around and we could instantly picture what an incredible weekend it would be, with the possibility of spending a few days surrounded by our friends and family, and not just have the wedding over in a flash. The reality was far beyond what we had expected, Ash Barton is a truly magical place and all of our guests were wowed by it's beauty. Simon was most helpful and professional. He gave excellent and invaluable advice throughout the planning stages. We also found it incredibly refreshing to be able to plan and do as we liked for our wedding and not have the usual restrictions from the venue. This DIY approach suited us perfectly and contributed to making it the wedding of our dreams. Just spent a wonderful weekend at ash Barton celebrating my daughter and son-in-law's wedding and it couldn't have been more perfect or beautiful from start to finish, a fabulous family get together enjoyed by all. Thank you very much to Pete who was amazing and such a help! Just got back from our amazing wedding weekend and couldn't ask for anymore. Pete was extremely helpful and it was an absolutely smashing venue. Many happy memories made! We will definately need to return as Mr and Mrs Hill!! i just had my stag do at ash barton. i can not rate it highly enough. simon made all the arrangements clear and easy, he was friendly and professional. he helped me every step of the way and calmed me down when i needed it. pete the care taker made us feel well come and confident that he was always on hand. the house and facilities are perfect, beds rooms showers pool and games room exceeded expectations. if you are thinking of hiring the estate i can 100% say go for it. you will not be disappointed. thanks you simon and thank you pete. you gave me some fantastic memories. Had our wedding here on 7th Nov 2015 and it was perfect! Everyone loved the estate and the facilities. Hated coming home! The kitchen is such a great communal room and I have to say we are really missing Pete and Alfie! If you book Ash Barton, please book Pete for as long as you can. He is a star and is always on hand to help. He looked so smart in his suit, directing the traffic on the morning of the wedding, everyone thought he was a guest at the wedding. Thank you to Simon, Julie, Pete and Alfie. You have made the whole experience memorable! Another great week at Ash Barton....fun was had counting all the mirrors. ..116 we think! We are delighted to share our superb experience at Ash Barton. The house exceeded our expectations. We could not have wished for a happier and more successful weekend. It was a perfect 'home' to host in and celebrate my husband's 5oth birthday with a group of dear friends. There was so much space for us all and the house is brilliantly stocked - from coffee cups, wine glasses to games and a very efficient site manager who is discreet but on call if needed. Simon the owner was hugely helpful and recommended H&A Catering for our Birthday dinner in the Chapel. It was splendid. The Chapel looked stunning with church candles, tea lights and fairy lights - so festive and elegant. It was so exciting and the Caterers gave us a feast fit for a king. They were amazing : professional, charming, thoughtful & efficient. They nailed the occasion. Our weekend was truly perfect. My only wish is that we had another special occasion coming up so that we could book Ash Barton again right now! Don't wait if you are thinking of booking - the dates get snapped up! This is such a fantastic place to stay - our week was just brilliant, so much to do, and a beautiful setting. the house really does have everything you could want and Pete was always on hand to help (or bring fresh eggs from the chickens!). Our chapel wedding at the start of the week was initimate and simple, and the grounds make a great backdrop for photos. The highlights for adults and kids alike were the pool and games barn which meant every day was packed with fun even when the weather was less kind to us. We used 'Guess Who Is coming to Dinner' to cater for part of our stay, including the wedding and a BBQ, and they were simply superb - and the other people we used for the wedding (Evolve photography, Lucy Cheetham who did the cakes, Phoenix entertainments for an afternoon of outdoor games in the grounds, Coastal Zen for a morning of pampering at the house) were all excellent, and taken from the suppliers list for Ash Barton which was so helpful. It really is a brilliant house, with everything we needed for a comfortable stay. Would heartily recommend a family or friends group stay here! 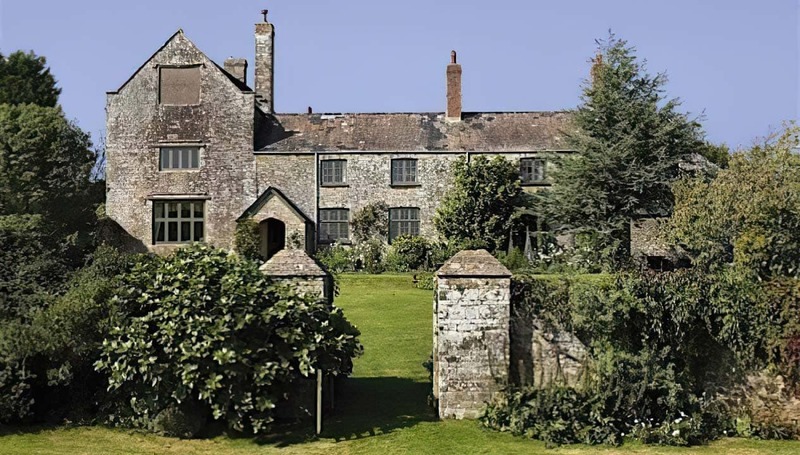 The pretty and picturesque Ash Barton Estate, a charming 17th century manor house romantically placed in the soft rolling hills of North Devon. The grand yet unpretentious house with the amenities usually found in 5* hotels was a super relaxing retreat, perfect for the week away with 16 friends just shared. So relaxing indeed some hardly felt the need to venture off the estate but chose to spend time languishing in the beautiful rooms with views out over the pretty grounds and beyond, having fun times in the games rooms and indoor heated swimming pool. The grounds themselves a mixture of old world horticultural splendour with pretty walled gardens and rugged country semi-wild walks to enchanting woods and ponds with resting spots to look out and savour the beautiful landscape. Real live chickens roam the grounds giving eggs plentiful, while the beehives house our buzzy friends. Those who did venture out found beautiful local beaches, walks and restaurants. On a green note the estate is self sufficient producing its own electricity! Highly recommend! The Ash Barton is too amazing for words. An unforgettable week spent in the most beautiful of surroundings. This house is amazing, the grounds are breathtaking and with so much to keep you entertained within the endless splendid acreage and awesome facilities. Have been blown away by everything The Ash Barton has to offer and am taking with me memories which I'll never forget. A piece of paradise for any occasion. Seeing is believing! An experience I will always treasure. A truly wonderful place to spend time with friends and family: Ash Barton offers a beautifully chic yet homely backdrop, a plethora activities to entertain every guest come rain or shine and a Pete on hand to help with anything!! Whatever your occasion, Ash Barton is an amazing venue in an unrivalled location! We are so so happy we chose Ash Barton for our wedding last week. It was the most beautiful and amazing venue! Getting married outside was such a dream, despite the rain, and Pete is the most incredible and helpful guy! We wish we could do it all again!! This is the perfect venue for a DIY wedding - you can personalise everything. We hope to return in the future for family holidays! We stayed in Ash Barton for our company team-building 'retreat' at the end of March and had a fantastic time.,The house is absolutely wonderful, so much space and some brilliant facilities too - including a heated swimming pool and a huge games barn with table tennis, snooker, badminton and almost every other activity you could want.,We easily fitted 30+ into the living room for presentations, dining room for meals, and everyone had plenty of bedroom space. The kitchen is v...ery well equipped too - allowed us to cook for a large number quite easily.,The setting is beautiful, really peaceful, a fantastic way to escape the hustle and bustle of central London for a few days. The coast is just a few miles away too if you fancy a seaside walk.,Simon, the manager, was very helpful and friendly - he made us feel really welcome and ensure we had everything we needed throughout.,All in all, a great experience which I would recommend to any large group if you're looking for somewhere to escape for a weekend.,Thanks Ash Barton! We stayed in Ash Barton for our company team-building 'retreat' at the end of March and had a fantastic time. The house is absolutely wonderful, so much space and some brilliant facilities too - including a heated swimming pool and a huge games barn with table tennis, snooker, badminton and almost every other activity you could want. We easily fitted 30+ into the living room for presentations, dining room for meals, and everyone had plenty of bedroom space. The kitchen is very well equipped too - allowed us to cook for a large number quite easily. The setting is beautiful, really peaceful, a fantastic way to escape the hustle and bustle of central London for a few days. The coast is just a few miles away too if you fancy a seaside walk. Simon, the manager, was very helpful and friendly - he made us feel really welcome and ensure we had everything we needed throughout. All in all, a great experience which I would recommend to any large group if you're looking for somewhere to escape for a weekend. Thanks Ash Barton!